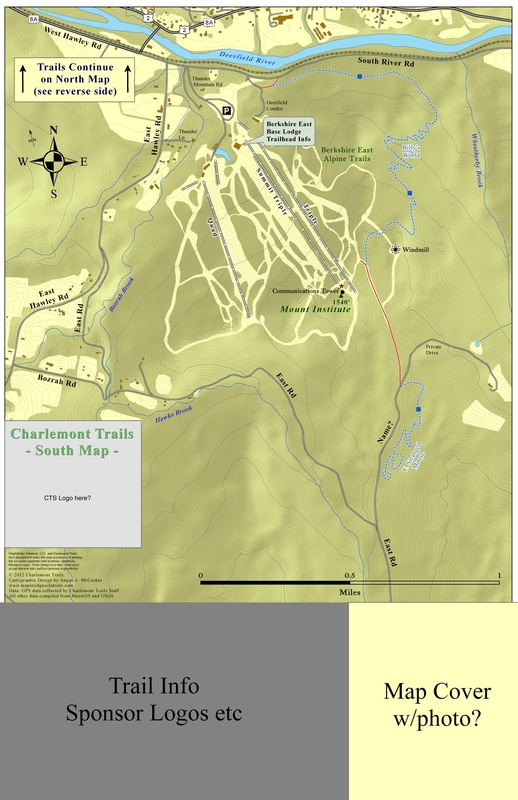 Charlemont Trails System - Huge thanks to Harold Green! The town of Charlemont MA. is a hilltown community of about 1,300 residents located along the Deerfield River and the scenic Mohawk Trail in northwestern Massachusetts. Settled in 1744, Charlemont covers 26 square miles and is still home to working farms and cottage industries as well as many recreational opportunities from mountain biking to whitewater rafting to downhill skiing. The Charlemont Trails project is a joint venture between NEMBA and several landowners around the center of Town, and crossing to the south into neighboring Hawley MA. The project began in the summer of 2010 with the construction of a 3 mile one-way trail from the summit of Mt. Institute to the parking lot at Berkshire East. This trail, dubbed Billy’s World, features some nice bermed corners, several large rock features, and some planned boardwalks crossing the many seeps endemic to these hills (until the boardwalk project is completed, use caution and good judgment in riding or by-passing the wet areas). The summer of 2011 saw much of the construction focus on the other side of the valley including buffing the major trails at Zoar Outdoor Adventure Resort (notice the recursive acronymJ). The lone exception was the construction of the E. Stranged Moose trail on the summit of Mt. Institute. This trail winds circuitously for about 2 miles from just past the “T” at the top of East Rd. to the top of Billy’s World. The Zoar trails were constructed, but un-blazed and suitable for very advanced riders only, prior to NEMBA’s assistance in re-routing, bridging, and bench-work. The first trail, King Phillip’s, we recommend as the climbing trail of the pair, begins in the camping area and ascends to the top of the Zip-Line road. The second, the West Side Trail, begins about 100 yards to the west of the top of King Phillip’s and descends back to the Zoar parking lot. Connecting these two on the western shoulder of Warfield Mtn is the Little Rock Trail. All of these three trails feature a nice mix of natural rock, twisty navigation of hummocks, occasional steeps, there is about 700 feet of elevation change from the Zoar parking area to the top of these trails. Above and to the north and west of the Zoar trails are the trails most easily accessed from the Warfield House parking area. The main trail in this area is the Zoar-Warfield Connector. This trail runs from the Warfield House banquet parking lot to the intersection of the Little Rock and West Side trails mentioned above. This trail meanders through the sugarbush before ascending to the eastern shoulder of Warfield Mtn. There is some nice exposure as the trail runs along some large boulders and cliffs. At the mid-point of the Connector, is the intersection with the TV Tower Trail. The TV Tower trail, as its name implies, climbs to the summit of Warfield Mtn, where the 1970s community television antennae tower is located. Long obsolete courtesy of the dish throughout the community, the tower and shed still stand today. At about the half-way point of the TV Tower trail, is the intersection with Get Smart, a circuitous adventure through the forest taking advantage of nearly every rock feature possible. Get Smart and the TV Tower Trail, joint an access road just short of the summit, follow that, or detour onto Agent 99 for a more circuitous route to the top of Warfield Mtn. Those faint of heart, or careful and wise by nature, might wish to avoid the rock spine just before you reach the top. 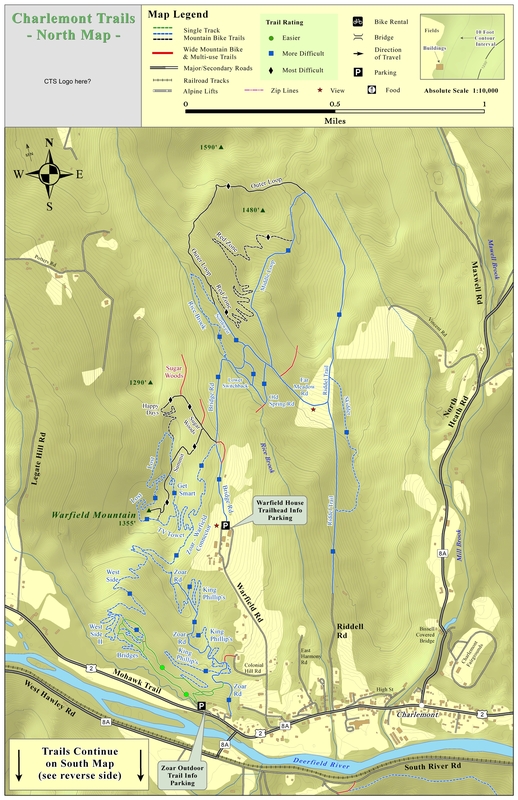 From the summit, visitors can either take the access road or opt for the more technical Lost around the Western Shoulder of Warfield Mtn. Also accessible from the Warfield Parking Lot, are trails on the other side of Rice Brook. Take the Brook Road, climb up to the Sound of Music Meadow. From there, you have two options, less experienced riders can get a nice run through some of the least technical and flattest trails in Charlemont by taking a right at the far gate, then an immediate left onto Skidder. This brings riders to the Druid Ridge area with about 2 miles of recovered running and hiking trails that skirt the ridge top. Featured here are few rocks, gentle slopes and wide corners. Those seeking more aggressive riding should take a left at the gate and follow Riddel Road to the top of Riddel Ridge. From there they can catch the 3-mile tight, technical and challenging Red Zone trail and then the Rice Brook trail back to the bridge they crossed earlier. Intermediate riders, may opt instead to look for a rock cairn on the left and ride Sweet 16 to the mid-point of Red Zone or follow the Middle Loop Road back to the brook. More trails added weekly, but this is a quick summary of what’s on the ground now. Local Bike Shops Advertise Here !! Local Websites Advertise Here !! - Free Links may be applicable.. Just Ask..
Land Manager & other Info Contact Bikerag - To update land manager info. To view larger version of map, right click on map and select View Image. Copyright by Bikerag.com, LLC. All rights reserved.